Banks, investors, and other financial actors are key players in the global economy and seem to increasingly affect forests, oceans and other ecosystems around the world. At the same time, we know surprisingly little of the extent of these effects. It's time ecologists and other global change scholars start paying much more attention to how these actors could impact on biodiversity and ecosystem services worldwide. These are the main conclusions in a new article published in Trends in Ecology and Evolution (TREE) by a team of researchers from GEDB, Stockholm Resilience Institute (SRC) and the Stockholm Environment Institute. The study is the first to explore the connections between financial markets and ecological change in depth, including the first mapping of the development of ultrafast so called "algorithmic trade" with commodities, many of which have links to ecosystems. "Financial actors often fail to integrate ecological understanding in their investment decisions. This is not only bad news for the environment, such failure also poses serious financial risks to global investors," says lead author Victor Galaz, SRC. 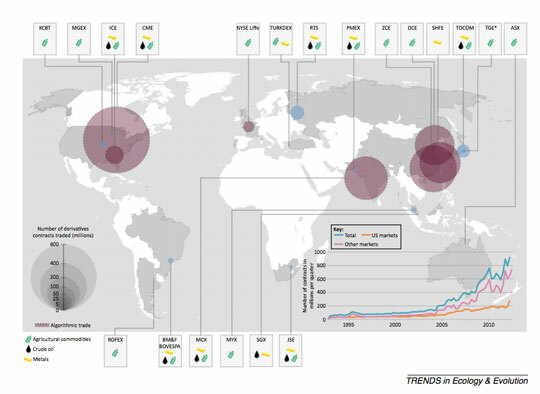 Map from the article in TREE showing the 20 largest commodity derivatives markets. The purple circles indicate algorithmic trade, blue circles indicate no algorithmic trade. The graph in the lower right corner shows the rapid increase in the turnover of commodity futures contracts. Some of the connections between the financial and ecological systems are direct with simple causal links. One such example is 'green bonds' - bonds where the proceeds will be used to finance projects and activities that promote environmental sustainability. They have quickly gained investor attention because they offer the opportunity to finance projects that generate both profits and environmental benefits. The market for green bonds has grown from 11 billion USD in 2013 to between 50 and 100 billion in 2015, and there is a growing need to assess their actual effect on the environment. "Financial institutions can act as a powerful force of positive change by influencing corporate behaviour. But for these financial actors to support the transition towards a sustainable economy we need to better demonstrate the inter-linkages between financial systems and social-ecological change," says co-author Cecilia Repinski, GEDB. Another direct link between financial actors and sustainability is the promising sign that institutional investors that operate on government mandates, such as national pension funds, are increasingly required to act in accordance with sustainability principles. Other links between financial markets and ecosystems are more indirect and unfold through complex causal pathways. One example, is the new study's mapping of the increasing use of trading robots or algorithmic trade in these global markets. Trading algorithms process increasing amounts of market information (such as news items) and execute trades within microseconds with minimal human interaction. Such automated trade, often referred to as 'algorithmic trade' (robotic trade), has been conducted by large financial actors for some time, and have transformed the speed and nature of financial trade. The new study shows that algorithmic trading now takes place in all major so-called commodity derivative markets in the USA, Europe, and Asia. Simply put, a commodity derivative is the right to trade a commodity at an agreed price in the future. In addition new actors, such as pension funds and hedge funds, have entered commodity derivative markets. These actors tend to have a limited interest in the underlying physical commodity (e.g. cocoa or wheat) and rather invest in commodity derivatives to diversify their investment portfolios and reduce risks. "There are concerns that the entry of such financial actors might distort commodity prices by creating large price swings in commodities. Our study indicates that such concerns might be valid but that we need much better analyses of the secondary effects on people's livelihoods and ecosystems," says Victor Galaz. In conclusion, the changes in financial markets are important but poorly understood, and create a new type of 'telecoupling' – new global connections between human and natural systems with socioeconomic and environmental effects. "It is high time for ecologists, financial economists, and global change scholars to explore in depth the intricate and complex interplay between financial and ecological systems," concludes co-author Johan Gars. Reference: Galaz, V., J. Gars, F. Moberg, B. Nykvist, C. Repinski. 2015. Why Ecologists Should Care About Financial Markets. Trends in Ecology & Evolution 30, Issue 10, p571–580.